A black body or blackbody is an idealized physical body that absorbs all incident electromagnetic radiation, regardless of frequency or angle of incidence. (It does not only absorb radiation, but can also emit radiation. The name "black body" is given because it absorbs radiation in all frequencies, not because it only absorbs.) A white body is one with a "rough surface [that] reflects all incident rays completely and uniformly in all directions." It is an ideal emitter: at every frequency, it emits as much or more thermal radiative energy as any other body at the same temperature. An approximate realization of a black surface is a hole in the wall of a large insulated enclosure (an oven). Any light entering the hole is reflected or absorbed at the internal surfaces of the body and is unlikely to re-emerge, making the hole a nearly perfect absorber. When the radiation confined in such an enclosure is in thermal equilibrium, the radiation emitted from the hole will be as great as from any body at that equilibrium temperature. Other examples of nearly perfect black materials are super black, prepared by chemically etching a nickel–phosphorus alloy, and vantablack made of carbon nanotubes; both absorb 99.9% of light or more. Using this model the effective temperature of stars is estimated, defined as the temperature of a black body that yields the same surface flux of energy as the star. If a star were a black body, the same effective temperature would result from any region of the spectrum. For example, comparisons in the B (blue) or V (visible) range lead to the so-called B-V color index, which increases the redder the star, with the Sun having an index of +0.648 ± 0.006. 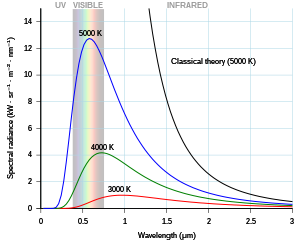 Combining the U (ultraviolet) and the B indices leads to the U-B index, which becomes more negative the hotter the star and the more the UV radiation. Assuming the Sun is a type G2 V star, its U-B index is +0.12. The two indices for two types of most common star sequences are compared in the figure (diagram) with the effective surface temperature of the stars if they were perfect black bodies. There is a rough correlation. 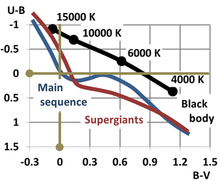 For example, for a given B-V index measurement, the curves of both most common sequences of star (the main sequence and the supergiants) lie below the corresponding black-body U-B index that includes the ultraviolet spectrum, showing that both groupings of star emit less ultraviolet light than a black body with the same B-V index. It is perhaps surprising that they fit a black body curve as well as they do, considering that stars have greatly different temperatures at different depths. For example, the Sun has an effective temperature of 5780 K, which can be compared to the temperature of its photosphere (the region generating the light), which ranges from about 5000 K at its outer boundary with the chromosphere to about 9500 K at its inner boundary with the convection zone approximately 500 km (310 mi) deep. ^ Mahmoud Massoud (2005). "§2.1 Blackbody radiation". 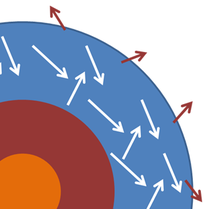 Engineering thermofluids: thermodynamics, fluid mechanics, and heat transfer. Springer. p. 568. ISBN 978-3-540-22292-7. ^ The emissivity of a surface in principle depends upon frequency, angle of view, and temperature. However, by definition, the radiation from a gray body is simply proportional to that of a black body at the same temperature, so its emissivity does not depend upon frequency (or, equivalently, wavelength). See Massoud Kaviany (2002). "Figure 4.3(b): Behaviors of a gray (no wavelength dependence), diffuse (no directional dependence) and opaque (no transmission) surface". Principles of heat transfer. Wiley-IEEE. p. 381. ISBN 978-0-471-43463-4. and Ronald G. Driggers (2003). Encyclopedia of optical engineering, Volume 3. CRC Press. p. 2303. ISBN 978-0-8247-4252-2. ^ Some authors describe sources of infrared radiation with emissivity greater than approximately 0.99 as a black body. See "What is a Blackbody and Infrared Radiation?". Education/Reference tab. Electro Optical Industries, Inc. 2008. ^ a b Ai Lin Chun (25 Jan 2008). "Carbon nanotubes: Blacker than black". Nature Nanotechnology. doi:10.1038/nnano.2008.29. ^ Translated by F. Guthrie from Annalen der Physik: 109, 275-301 (1860): G. Kirchhoff (July 1860). "On the relation between the radiating and absorbing powers of different bodies for light and heat". The London, Edinburgh, and Dublin Philosophical Magazine and Journal of Science. 20 (130). ^ The notion of an infinitely thin layer was dropped by Planck. See Planck 1914, p. 10, footnote 2, . ^ a b Siegel, Robert; Howell, John R. (2002). Thermal Radiation Heat Transfer; Volume 1 (4th ed.). Taylor & Francis. p. 7. ISBN 978-1-56032-839-1. ^ a b Corrections to the spectrum do arise related to boundary conditions at the walls, curvature, and topology, particularly for wavelengths comparable to the cavity dimensions; see Roger Dale Van Zee; J. Patrick Looney (2002). Cavity-enhanced spectroscopies. Academic Press. p. 202. ISBN 978-0-12-475987-9. ^ Clement John Adkins (1983). "§4.1 The function of the second law". Equilibrium thermodynamics (3rd ed.). Cambridge University Press. p. 50. ISBN 978-0-521-27456-2. ^ In simple cases the approach to equilibrium is governed by a relaxation time. In others, the system may 'hang up' in a metastable state, as stated by Adkins (1983) on page 10. For another example, see Michel Le Bellac; Fabrice Mortessagne; Ghassan George Batrouni (2004). Equilibrium and non-equilibrium statistical thermodynamics. Cambridge University Press. p. 8. ISBN 978-0521821438. ^ The approach to thermal equilibrium of the radiation in the cavity can be catalyzed by adding a small piece of matter capable of radiating and absorbing at all frequencies. See Peter Theodore Landsberg (1990). Thermodynamics and statistical mechanics (Reprint of Oxford University Press 1978 ed.). Courier Dover Publications. p. 209. ISBN 978-0-486-66493-4. ^ Ludwig Bergmann; Clemens Schaefer; Heinz Niedrig (1999). Optics of waves and particles. Walter de Gruyter. p. 595. ISBN 978-3-11-014318-8. Because the interaction of the photons with each other is negligible, a small amount of matter is necessary to establish thermodynamic equilibrium of heat radiation. ^ The fundamental bosons are the photon, the vector bosons of the weak interaction, the gluon, and the graviton. See Allan Griffin; D. W. Snoke; S. Stringari (1996). Bose-Einstein condensation. Cambridge University Press. p. 4. ISBN 978-0-521-58990-1. ^ Paul A. Tipler (1999). "Relative intensity of reflected and transmitted light". Physics for Scientists and Engineers, Parts 1-35; Part 39 (4th ed.). Macmillan. p. 1044. ISBN 978-0-7167-3821-3. ^ Massoud Kaviany (2002). "Figure 4.3(b) Radiation properties of an opaque surface". Principles of heat transfer. Wiley-IEEE. p. 381. ISBN 978-0-471-43463-4. ^ BA Venkanna (2010). "§10.3.4 Absorptivity, reflectivity, and transmissivity". Fundamentals of heat and mass transfer. PHI Learning Pvt. Ltd. pp. 385–386. ISBN 978-81-203-4031-2. ^ An extensive historical discussion is found in Jagdish Mehra; Helmut Rechenberg (2000). The historical development of quantum theory. Springer. pp. 39 ff. ISBN 978-0-387-95174-4. ^ Bradley Quinn (2010). Textile Futures. Berg. p. 68. ISBN 978-1-84520-807-3. ^ a b K. Mizuno; et al. (2009). "A black body absorber from vertically aligned single-walled carbon nanotubes". Proceedings of the National Academy of Sciences. 106 (15): 6044–6077. Bibcode:2009PNAS..106.6044M. doi:10.1073/pnas.0900155106. PMC 2669394. PMID 19339498. ^ Zu-Po Yang; et al. (2008). "Experimental observation of an extremely dark material made by a low-density nanotube array". Nano Letters. 8 (2): 446–451. Bibcode:2008NanoL...8..446Y. doi:10.1021/nl072369t. PMID 18181658. ^ See description of work by Richard Brown and his colleagues at the UK's National Physical Laboratory: Mick Hamer (correspondent) (6 February 2003). "Mini craters key to 'blackest ever black'". New Scientist Magazine Online. ^ Figure modeled after E. Böhm-Vitense (1989). "Figure 4.9". Introduction to Stellar Astrophysics: Basic stellar observations and data. Cambridge University Press. p. 26. ISBN 978-0-521-34869-0. ^ David H. Kelley; Eugene F. Milone; Anthony F. (FRW) Aveni (2011). Exploring Ancient Skies: A Survey of Ancient and Cultural Astronomy (2nd ed.). Springer. p. 52. ISBN 978-1-4419-7623-9. ^ David F Gray (February 1995). "Comparing the sun with other stars along the temperature coordinate". Publications of the Astronomical Society of the Pacific. 107: 120–123. Bibcode:1995PASP..107..120G. doi:10.1086/133525. Retrieved 2012-01-26. ^ M Golay (1974). "Table IX: U-B Indices". Introduction to astronomical photometry. Springer. p. 82. ISBN 978-90-277-0428-3. ^ Lawrence Hugh Aller (1991). Atoms, stars, and nebulae (3rd ed.). Cambridge University Press. p. 61. ISBN 978-0-521-31040-6. ^ Kenneth R. Lang (2006). Astrophysical formulae, Volume 1 (3rd ed.). Birkhäuser. p. 23. ISBN 978-3-540-29692-8. ^ B. Bertotti; Paolo Farinella; David Vokrouhlický (2003). "Figure 9.2: The temperature profile in the solar atmosphere". New Views of the Solar System. Springer. p. 248. ISBN 978-1-4020-1428-4. ^ Schutz, Bernard (2004). Gravity From the Group Up: An Introductory Guide to Gravity and General Relativity (1st ed.). Cambridge University Press. p. 304. ISBN 978-0-521-45506-0. ^ PCW Davies (1978). "Thermodynamics of black holes" (PDF). Rep Prog Phys. 41 (8): 1313–1355. Bibcode:1978RPPh...41.1313D. doi:10.1088/0034-4885/41/8/004. Archived from the original (PDF) on 2013-05-10. ^ Robert M Wald (2005). "The thermodynamics of black holes". In Andrés Gomberoff; Donald Marolf (eds.). Lectures on quantum gravity. Springer Science & Business Media. pp. 1–38. ISBN 978-0-387-23995-8. ^ Bernard J Carr & Steven B Giddings (2008). "Chapter 6: Quantum black holes". Beyond Extreme Physics: Cutting-edge science. Rosen Publishing Group, Scientific American (COR). p. 30. ISBN 978-1-4042-1402-6. ^ Valeri P. Frolov; Andrei Zelnikov (2011). "Equation 9.7.1". Introduction to Black Hole Physics. Oxford University Press. p. 321. ISBN 978-0-19-969229-3. ^ White, M. (1999). "Anisotropies in the CMB" (PDF). Proceedings of the Los Angeles Meeting, DPF 99. UCLA. See also arXive.org. ^ "Stefan–Boltzmann constant". NIST reference on constants, units, and uncertainty. Retrieved 2012-02-02. ^ A simple example is provided by Srivastava M. K. (2011). "Cooling by radiation". The Person Guide to Objective Physics for the IIT-JEE. Pearson Education India. p. 610. ISBN 978-81-317-5513-6. ^ M Vollmer; K-P Mõllmann (2011). "Figure 1.38: Some examples for temperature dependence of emissivity for different materials". Infrared Thermal Imaging: Fundamentals, Research and Applications. John Wiley & Sons. p. 45. ISBN 978-3-527-63087-5. ^ Robert Osiander; M. Ann Garrison Darrin; John Champion (2006). MEMS and Microstructures in aerospace applications. CRC Press. p. 187. ISBN 978-0-8247-2637-9. ^ Krishna Rajagopal; Frank Wilczek (2001). "6.2 Coling by Neutrino Emissions (pp. 2135-2136) – The Condensed Matter Physics of QCD". In Mikhail A. Shifman (ed.). At The Frontier of Particle Physics: Handbook of QCD (On the occasion of the 75th birthday of Professor Boris Ioffe). 3. Singapore: World Scientific. pp. 2061–2151. arXiv:hep-ph/0011333v2. CiteSeerX 10.1.1.344.2269. doi:10.1142/9789812810458_0043. ISBN 978-981-02-4969-4. For the ﬁrst 105–6 years of its life, the cooling of a neutron star is governed by the balance between heat capacity and the loss of heat by neutrino emission. ... Both the speciﬁc heat CV and the neutrino emission rate Lν are dominated by physics within T of the Fermi surface. ... The star will cool rapidly until its interior temperature is T < Tc ∼ ∆, at which time the quark matter core will become inert and the further cooling history will be dominated by neutrino emission from the nuclear matter fraction of the star. ^ Walter Lewin; Warren Goldstein (2011). "X-ray bursters!". For the love of physics. Simon and Schuster. pp. 251 ff. ISBN 978-1-4391-0827-7. ^ TE Strohmayer (2006). "Neutron star structure and fundamental physics". In John W. Mason (ed.). Astrophysics update, Volume 2. Birkhäuser. p. 41. ISBN 978-3-540-30312-1. Hermann, A. (1971). The Genesis of Quantum Theory. Nash, C.W. (transl.). MIT Press. ISBN 978-0-262-08047-7. a translation of Frühgeschichte der Quantentheorie (1899–1913), Physik Verlag, Mosbach/Baden. Kangro, H. (1976). Early History of Planck's Radiation Law. Taylor and Francis. ISBN 978-0-85066-063-0. Kondepudi, D.; Prigogine, I. (1998). Modern Thermodynamics. From Heat Engines to Dissipative Structures. John Wiley & Sons. ISBN 978-0-471-97393-5. Kragh, H. (1999). Quantum Generations: a History of Physics in the Twentieth Century. Princeton University Press. ISBN 978-0-691-01206-3. Kuhn, T. S. (1978). Black–Body Theory and the Quantum Discontinuity. Oxford University Press. ISBN 978-0-19-502383-1. Loudon, R. (2000) . The Quantum Theory of Light (third ed.). Cambridge University Press. ISBN 978-0-19-850177-0. Mandel, L.; Wolf, E. (1995). Optical Coherence and Quantum Optics. Cambridge University Press. ISBN 978-0-521-41711-2. Mehra, J.; Rechenberg, H. (1982). The Historical Development of Quantum Theory. volume 1, part 1. Springer-Verlag. ISBN 978-0-387-90642-3. Mihalas, D.; Weibel-Mihalas, B. (1984). Foundations of Radiation Hydrodynamics. Oxford University Press. ISBN 978-0-19-503437-0. Rybicki, G. B.; Lightman, A. P. (1979). Radiative Processes in Astrophysics. John Wiley & Sons. ISBN 978-0-471-82759-7.